Sam Hobbs captained Cardiff Blues during the 2013 season. 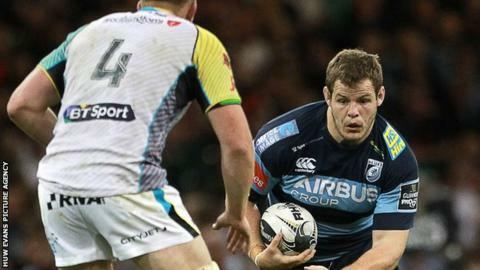 Prop forward Sam Hobbs will join Newport Gwent Dragons from Cardiff Blues at the end of the season. The 27-year-old has played more than 100 games for the Blues after recovering from a stroke suffered during a game in 2010. Brecon-born Hobbs previously played for Pontypridd and represented Wales at a U-19s and U-20s level. "I am really looking forward to the new challenge ahead at Newport Gwent Dragons," said Hobbs. Dragons director of rugby Lyn Jones added: "I have always been impressed with Sam as an all round player. "When we were made aware of his availability, we had no hesitation in making him an offer to stay in Wales, beating off offers from England. "He will add a great deal of experience and character to a maturing Newport Gwent Dragons squad." Hobbs had to take a six month break from rugby after suffering a "small blood clot" on his brain in 2010.